When it comes to choosing your baby’s first bed, comfort, safety, and flexibility are key. Our collection of newborn cribs features the most exceptionally well-designed cribs you’ll find anywhere, boasting a combination of style and quality that are unrivaled in the children’s furniture industry. From easily-adjustable models to timeless designs to suit your nursery, we’re pleased to offer the best mini cribs in Los Angeles. Every child is unique, and there’s no reason you shouldn’t have adaptable and effortlessly flexible nursery furniture to match. 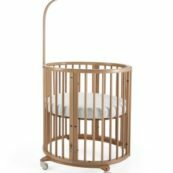 The Stokke Sleepi Mini is an ideal choice among newborn cribs, configured to create a cozy, nest-like environment that can be contracted, expanded, or height adjusted for the perfect fit. Best yet, cribs like the Stokke Sleepi Mini can be easily transported from room to room. Of course, nothing is more important than the safety of your little one, and each crib we sell is expertly designed to conform to the highest standards of safety in both materials and construction, so both you and your baby can sleep soundly. For the highest quality selection of mini cribs, Los Angeles is the perfect place to start. Shop locally and find your favorite piece in our collection of newborn cribs, or consult with our dedicated team to create the perfect piece of custom furniture. Whatever you’re looking for, we invite you to visit us in Santa Monica, Burbank, or Upland, or contact us at (818) 841-5544.